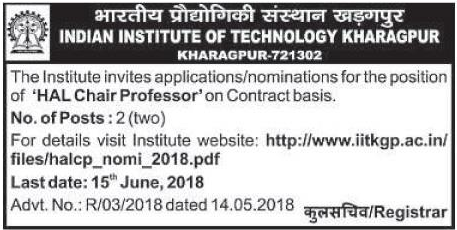 Indian Institute of Technology, Kharagpur has advertised in TELEGRAPH newspaper for the recruitment of HAL Chair Professor jobs vacancies. Interested and eligible job aspirants are requested to apply with in 15th June 2018. Check out further more details below. About College: The history of the IIT system dates back to 1946 when a committee was set up by Hon'ble Sir Jogendra Singh, Member of the Viceroy's Executive Council, Department of Education, Health and Agriculture to consider the setting up of Higher Technical Institutions for post war industrial development in India. The 22 member committee headed by Sri N.R.Sarkar, in its report, recommended the establishment of four Higher Technical Institutions in the Eastern, Western, Northern and Southern regions, possibly on the lines of the Massachusetts Institute of Technology, USA, with a number of secondary institutions affiliated to it. The HAL Chair will be responsible for conducting research & development in various areas related to aerospace technologies, facilitating technical consultancy, training programs and addressing other mutually agreed activities relevant to the HAL. The HAL Chair Professor will also initiate new academic / training programs, develop training modules for mentoring/ coaching of HAL personnel for knowledge update and capacity building. The Chair will facilitate annual conference of defence related industries and make efforts to conduct short-term courses by international faculty for the students of the Institute and engineers/professionals of HAL in new and emerging areas of the aerospace industry. How to Apply: The nominations may be sent to asregre@adm.iitkgp.ernet.in as soft copy (PDF) after obtaining the consent of the person being nominated. An individual can also directly send his/her CV. The hard-copy of nominations needs to be sent to the address below: in a properly sealed cover marked “NOMINATION FOR HAL CHAIR PROFESSOR”. Last Date for receiving nominations/applications is 15 June 2018.